The train struggles in the 2nd test because there is an actual increase in train "resistance" is due to the added resistance of the curve. 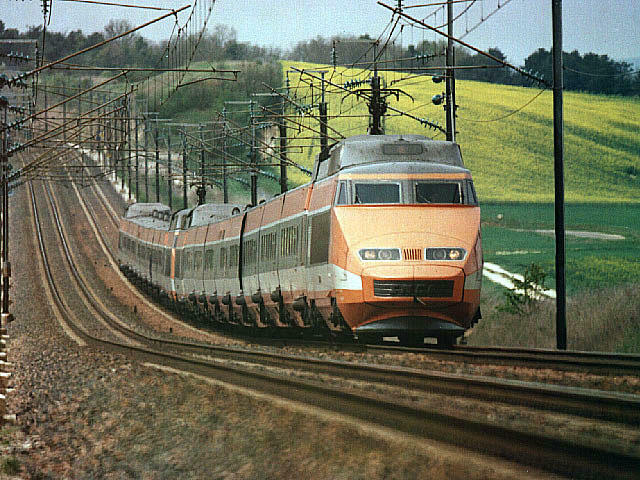 The train struggles in the second case because the changed curvature in the lateral plane changes the curvature in the vertical plane. There is no reason that this should happen - it just does. Last edited by cascaderailroad; February 11th, 2019 at 08:38 AM. Not necessarily. The gradient that the train actually experiences is the average over the length of the train. The engine might see more than 2%, the caboose less, but if they average out to 2% then that's what the train experiences. That's why you will often see instantaneous grades that exceed the allowed maximum. If the train is long enough, and the excess grade short enough, the average for the train is still within limits. And if the train isn't long enough then it's unlikely to be too heavy for that short-term excessive grade. So you actually have three grades to consider - the surveyor setting which is an average over spline points, the instantaneous readout from the HUD, and the average over the length of the train. Yes.. that makes total sense. Last edited by 1611mac; February 11th, 2019 at 07:35 AM. If I was to build a 2% grade, I wouldn't have one track spline at 0% and the following one 2%, I'd instead increase the grade over equal lengths of track spline. First spline would be a 0.5% grade, the second 1%, the third 1.5%, and the fourth 2%. It's a long upwards curve instead of just a short upwards curve. When the tracks near the top of the grade, I'd repeat the process backwards. The first spline is 2%, the second 1.5%, the third 1%, and the fourth 0.5%. Now it's a long, downwards curve instead of a short downwards curve. I find this to be an easier way for me to drive a train uphill as I've got more time to react in the change of grade instead of going immediately 0% to 2%. By 'time to react', I mean increasing the throttle settings to prevent me from stalling and having to back down the grade and try again. Last edited by jordon412; February 11th, 2019 at 09:39 AM. - One problem I had was that in learning how to use the Gradient tool I was using just one, two, or three splines with gradient set on each. If you apply a 2% gradient on each segment you do indeed get a firm 2% gradient from beginning to end. There is no transition. The first spline ends at zero and the last spline ends at whatever height is proper for the 2% gradient at that length. Start adding "zero" height segments to the transitions and you start getting the transitions on the "zero" level segments along with the gradients. - It appears that even if you have plenty of length for the end "transitions," transitions go "negative" and then come back to height. It makes no sense to me why a "set" 0.5 gradient (zero to 1.7 meters) 340 meters in length would need to transition into the negative before coming back up to zero at the low end. Last edited by cascaderailroad; February 11th, 2019 at 03:03 PM. You can specify that 'my max gradient will be 2%' but you have to decide how you measure it. Gradient is the change in height over a certain length. You need to choose the length you use for that calculation, because it has to be part of the specification. It certainly isn't the very short distance that the HUD uses for its instantaneous gradient figure - perhaps it's just an arbitrary figure, or perhaps it's based on some nominal length of train. If you specify gradient in Trainz when laying track then the gradient is always an average between spline points. That is convenient because it is easy to add, remove and change spline points - no additional information about the gradient needs to be provided. The alternative is to set the spline point height and let the gradient adjust itself - that is convenient when you are working to existing plans. If you have two segments with different gradients the transition has to be applied somehow as an adjustment to the nominal grade. In Trainz it is done by distributing the change roughly equally between the existing segment and the new one. That is a simple and sensible option, but it does mean that the grade before an upward transition can become negative. An alternative would be to lock in the grade of an existing section and apply the whole of the transition to the next section as laid. This creates a problem when trying to work out the effects of adding, deleting or moving spline points - the result becomes inconsistent as the system cannot know which segment to apply the gradient change to. Last edited by SailorDan; February 11th, 2019 at 03:36 PM. The train struggles in the 2nd test because there is an actual increase in train "resistance" is due to the added resistance of the curve. This effect happens on curves where there is no gradient - on level track with 0.0% grade. Since TS12 (maybe 10?) curve resistance has been include in Trainz. Typical estimate of the effect in real life is 0.8 x DoC lbf/ton, where DoC is the curve's degree of curvature and ton is 2000 lbf. For railroad curves in the US DoC is usually based on a 100 ft chord length. With a radius of R in ft, the DoC is approx. equal to 5730/R. The effect of curve resistance in Trainz appears to be in that general neighborhood. % grade is measured by dividing the rise in the track by the length measured along the track including any curves. It is not measured using rise divided by just the straight distance between the 2 points unless there are no curves between those points. Real railroads typically use compensated curves on grades where the grade is reduced thru the curve so the combined effect of the grade and curve are approximately the same as the uncompensated grade resistance. Since the grade resistance is 20 lbf/ton/percent grade, reducing the grade thru the curve by 0.04% x DoC reduces the total resistance by 0.8 x DoC lbf/ton which eliminates the effect of the curve. Thank you, Bob. This is thoroughly informative. I've never really studied the exact formula, but glad to see I'm in the ballpark. I've always guestimated around 75% (0.75 x DoC lbf/ton) for curves on grades just through "test and measure" while route building. An alternative would be to lock in the grade of an existing section and apply the whole of the transition to the next section as laid. This creates a problem when trying to work out the effects of adding, deleting or moving spline points - the result becomes inconsistent as the system cannot know which segment to apply the gradient change to. "Lock in a grade" - I've missed something. I didn't know anything could be "locked." Please explain. So my gradients are acceptable and my panel is fine. But that is what got me started on this whole thing. And once I get started I have to understand. I just couldn't see why a 2% specified grade wasn't 2%. I experimented and discovered that a 2% grade spanned 25 10 meter squares and so I began on that figure for my ending transition points. 25 squares was very close. And again, I thought the transitions would be added to the ends of the segments I defined. But I still don't understand why a 2% gradient has to go negative to transition. I'll study on it. But again... what is "locking in" a grade? Last edited by 1611mac; February 11th, 2019 at 06:31 PM. It's an alternative. It's the way that it would be done in the real world - glue your first section down firmly so that the sections you add will take the whole of the gradient transition. It's the way your customers might have used the 'grade' kits. But it's not practical in the virtual world because it makes the subsequent adjustment to spline points inconsistent. Of course, in the model world adjusting the equivalent of the spline points doesn't happen (unless you re-lay the whole thing). I guess it would be possible in the virtual world to make spline points immovable. Then you could fix a section of track to force the gradient adjustment into the 'next' section location. But it wouldn't be worth the tradeoff. And again, I thought the transitions would be added to the ends of the segments I defined. They aren't, for the sorts of reasons I stated above. But I still don't understand why a 2% gradient has to go negative to transition. Because the gradient transition is divided between the two segments. It really is as simple as that. It's no different then the model world, unless you are laying on a baseboard with the existing section firmly stuck down. If the existing section was only pinned at its ends (such as laying a viaduct) then it would bend down in the middle when you attached the next piece and bent it up. In Trainz the existing section is always pinned only at its end, so the middle will always bend down when you bend the next section up. But of course you get to choose the length of your sections, so creating the exact transition that you want is easy, unlike in the model world where you are restricted to setting the height for fixed lengths. Ahhh.... Got It! Thanks! Sorry to be such a pain. Thank you SailorDan (and all) for the help. I appreciate it!